The 5-star generals were Dwight D. Eisenhower and Omar Bradley. The four-star (“full”) Generals in the class of 1915 were James Van Fleet and Joseph T. McNarney. The three-star (Lieutenant Generals) Generals were Henry Aurand, Hubert R. Harmon, Stafford LeRoy Irwin, Thomas B. Larkin, John W. Leonard, George E. Stratemeyer, and Joseph M. Swing. This view was taken facing south around noon on May 3, 1915. In 1916 Lieutenant Swing was part of the punitive expedition to Mexico against Francisco Villa under the leadership of General John J. Pershing. In 1917, shortly after the US entered the war in Europe, Major Swing joined the artillery of the 1st Division in France. When he returned to the US in 1918, he became an aide-de-camp to the Army’s Chief of Staff, General Peyton C. March. On 8 July 1918, he married Josephine Mary March, the daughter of General March. 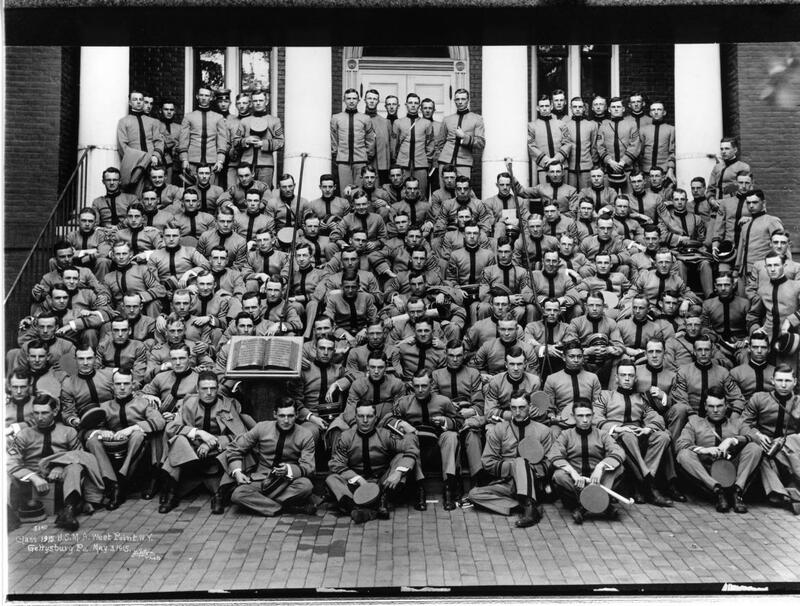 Later that year, he joined the 19th Field Artillery at Fort Myer, Virginia, and in 1921 sailed for Hawaii to command the 1st Battalion of the 11th Field Artillery at Schofield Barracks. In 1925, he returned to the States and assumed command of the 9th Field Artillery at Fort Des Moines, Iowa. He graduated with honors from the Field Artillery School at Fort Sill, and in 1927 he graduated from the Command and Staff School at Fort Leavenworth, Kansas. For the next four years, he was on duty in the Office of the Chief of Field Artillery in Washington, DC, and in 1933 he became chief of its war plans section. In 1935, he graduated from the Army War College in Washington and then joined the 6th Field Artillery at Fort Hoyle, Maryland. 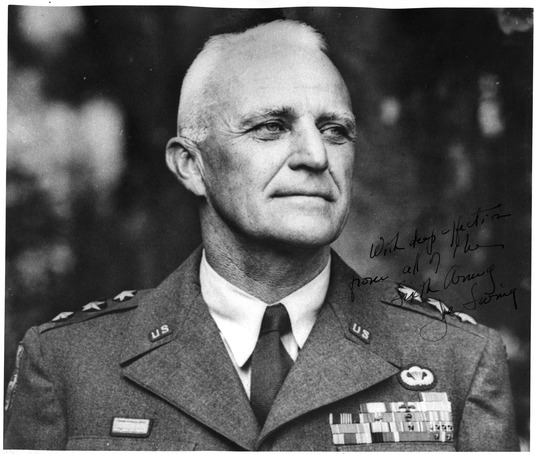 Next, he went to Fort Sam Houston where he was the chief of staff of the 2d Division from 1938 to 1940. Later, he commanded the 82d Horse Artillery Regiment of the 1st Cavalry Division at Fort Bliss, Texas and then commanded its division artillery. He was promoted to brigadier general in 1941 and at Camp Claiborne, Louisiana, organized the division artillery of the 82d Division, a move which was to project him into the brand new field of “airborne.” In Camp Claiborne, General Omar Bradley was the 82d Division commander. General Ridgway was the assistant division commander, and Colonel Maxwell D. Taylor was the chief of staff. In February of 1943, as a newly promoted major general, General Swing was assigned the task of activating the 11th Airborne Division at Camp Mackall, North Carolina, the Army’s third airborne division. Thus began for General Swing a tenure of service which was unique then and still remains a record: division commander of one division for five years, during which he activated the division, trained it, and commanded it in combat and during its subsequent occupation of Japan. During this period, General Swing and the 11th Airborne Division became synonymous; the man was the division and the division was the man. General Swing made his mark on the Army and on the thousands of men who passed through the 11th Airborne Division in a way which those of us who were fortunate enough to serve with and have known him will never forget. His subordinates and superiors have described General Swing with numerous adjectives: forceful, energetic, courageous, self-disciplined, purposeful, farsighted, innovative, just, sentimental, short-tempered, forgiving, sincere, considerate, demanding—and with it all, handsome, erect, prematurely gray, with a lean, tanned face from which steely-blue eyes focused with incredible sharpness either to find a mistake or an accomplishment of a subordinate. General Swing fitted all of those descriptive adjectives to one degree or another; illustrations to exemplify each trait abound, particularly in the lore of the 11th Airborne Division. And as the years go by and as the men of the 11th gather at reunions, the stories about the “old man” increase and take on a sharper and more pungent flavor. 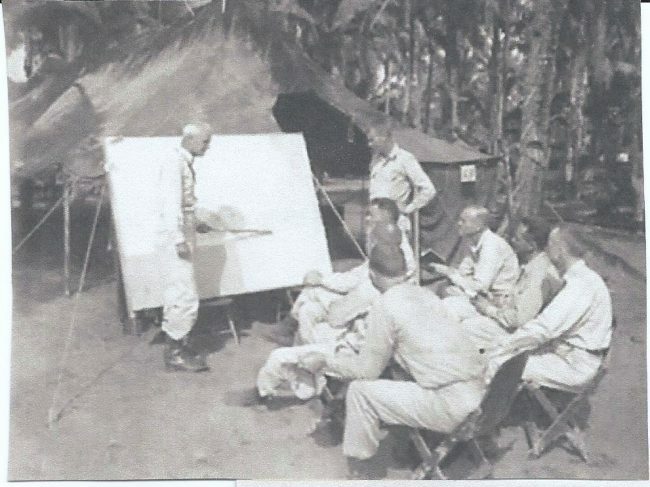 There is no doubt that General Swing was demanding in training, insisting on excellence, and setting and requiring the highest of standards for the 11th Airborne Division so that when it entered combat, after months of grueling training in Camp MacKall, Camp Polk, and New Guinea, the division was ready to take on the Japanese in the mud and rain across the uncharted central mountains of Leyte. 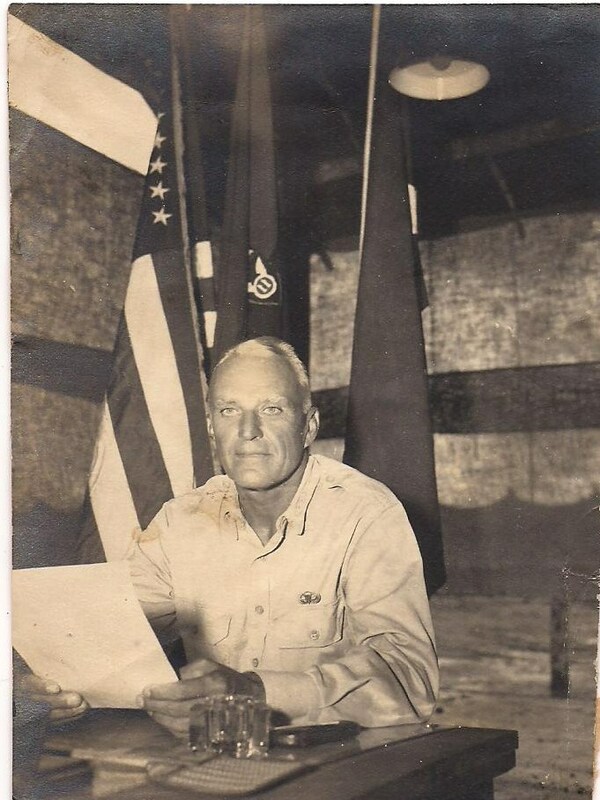 Early in its combat career, it was ready to thwart a Japanese parachute attack on the division command post and nearby San Pablo airfield at Burauen, Leyte. General Swing demonstrated his courage and vitality on that occasion by personally leading a Civil War-like attack across the airstrip with engineers, supply troops, and a glider field artillery battalion armed with carbines and rifles against the dug-in Japanese paratroopers who had had the audacity to attack the 11th Airborne from the air. In short order, the Japanese paratroopers, the elite Katori Shimpei of the Japanese forces, were routed, and the San Pablo airfield was back in the hands of the 11th Airborne Division. also, “The Gettysburg Daily, Wikipedia and Smitty’s scrapbook. And this is where we left off the day by day and monthly island-hopping offense of the Pacific War. You will be hearing often of General Swing, you might even get to admire him almost as much as Smitty did. Posted on November 20, 2017, in First-hand Accounts, WWII and tagged 1940's, Airborne, Army, family history, Gen. Swing, History, Military, Military History, Philippines, Tributes, veterans, war, WW2, WWII. Bookmark the permalink. 75 Comments. Thank you, penny. This man meant so much to so many!! IMO, we should make the politicians and those making a fortune off the war go out and worry whether an IED will get them or not. It’s a different world now, a politically correct attitude that will NOT win wars but will keep the media off their backs. Great post and story on General Swing, that picture of the Star studded Class has got to be a classic for that era. I must admit though that sometimes certain peoples are selected for advancement due to political requirements of the time. Predictable outcomes is the word, much like in the Vietnam war, so many medals are forecast to be allowed, hence the four VC winners from my unit, yet no other unit, not detracting from your post mate but much like Politicians, Military leaders are groomed early in their career. I guess we don’t do much grooming any more. 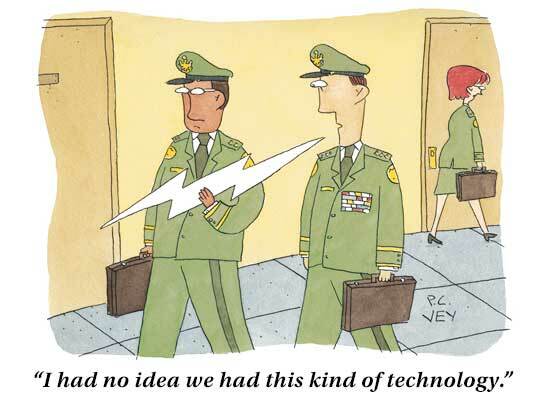 I always enjoy the Military Humor cartoons that you post. I especially liked the one about technology. I get a kick out of their humor too. I guess that’s why Beetle Bailey has been in the Sunday comics for so long – you and I are not alone!! In 1916 he was a lieutenant, in 1917 a Major, thats one big jump in a little over a year, jumping over a Captaincy apparently. 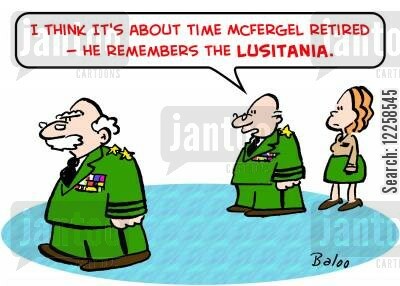 Must have been one hell of a good soldier even then to get such rapid promotion. Those jumps usually not only mean a good soldier, but done during combat. He must have been a brave man! Thank you very much, the same for you and yours!! Applesauce… no wonder they called it the class the stars fell on, that’s a lot of generals for one class. Have a lovely Thanksgiving, GP. Hugs. When I was thinking what to write, the time passed. It is easy to write thoughts in Native language, but in different language, take time to “select words”(T^T). Here, I readed also various comments,and I also think variously. The only thing I can say is that I have been feeling that ppl in other countries which don’t attack Japan are “friends of the same human being”. Tomorrow, Japan is “a day praying for Rich harvest”. Hell of a great leader. I greatly appreciate your interest here, Michael. And just think of all the data I’ve had to slide on, the Pacific was a very busy place indeed! While I’m familiar with the Pacific War I am enjoying learning more the history of the 11th and their General. A first rate leader by all accounts. The amount of training they received and their specialties were the beginnings of what are our special forces today. I appreciate your interest, Lloyd. To have that amount of respect is the sign of a great leader, a remarkable man and a remarkable career! As far as the 11th A/B’s Association is concerned, you won’t find a more respected leader. 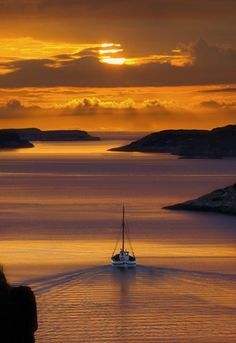 Thank you for reading this post!! General Swing certainly seems to be a major influence in your father’s life. His name has been repeated time and time again throughout your stories. General Swing was admired by his men and we should still admire his courage and leadership today. It would be great to know that some of our troops today have such a man looking out to save their lives and making certain they were trained to the point of perfection. Thank you, John. He was one of the most famous generals, but he should have been! Super profile and tribute to a fine general and human being, Gp. Thanks. Thank you very much for this comment, John. I know the men of the 11th and the Association whole-heartedly agree with you! Thank you for sharing Gen Swing with us! What an amazing man! BTW: I saw an interesting movie: Land of Mine. It is a 2015 Danish-German historical drama war film. It is inspired by real events and tells the story of German prisoners of war sent to clear landmines in postwar Denmark after World War II. It is estimated that over 2,000 German soldiers, including numerous teenagers, were forced to remove mines, with nearly half of them either getting killed or losing their limbs to explosions. I am not as well-read about the ETO as I should be and never heard of those events. Thank you for informing me about this documentary. I’ll look into this on other avenues as well. I’m glad you found Gen. Swing interesting, his leadership saved a lot of lives. God sends remarkable men – for the right moment. Or we don’t get through this thing. That is a wonderful way to look at it. You must be right because we’re still here. Another amazing soldier. I wonder where America would be if not for this man and many others. A side note: I taped Oliver North’s Frozen Chosin from War Stories. I can’t wait to watch it. I’ll bet, afraid i missed it. The Chosin Few deserve our remembrance!! I so enjoyed this read. The class the stars fell on… my! Quite impressive weren’t they?! Thank you for taking the time out of your day, Jennie. Yes they were! My pleasure, GP. Sounds like a great man. He was, a true leader. General Swing’s portrait and the description of his remarkable character clearly show why your dad and many other soldiers perceived him with respect and admiration. You see it too, eh Peter? They would have followed him anywhere! I didn’t know until reading this that Gen. Swing was part of “the class the stars fell on.” Excellent post, GP! That was some class out of West Point, eh? Hard to believe that much came from just one class!! I was proud to post this from General E.M. Flanagan, he not only served in the 11th Airborne, but I have spoken to him twice on the phone and have a letter from him. Interesting stuff as always in your blog! That is what I call a career in the military. Quite impressive to read his biography and realize how completely he had dedicated his life to the military. Did he have a family as well? When he passed away in 1984, his wife had predeceased him, but he was survived by a son and daughter. There is more to his story and we’ll meet him many times as we progress through 1945. It amazes me always at how many people it took to win the war. Thank goodness for people like General Swing. Very well written. Gen. Swing’s entire story is too long to tell in one post, but I’m sure you got the idea, Kayleen. I thank you for taking the time. That’s quite a career and quite the remarkable class. 1915 was certainly remarkable. Thanks for dropping by, Dan. Wish I could have met him! Thanks for reading it, He continued in the service and leading after the war, but that’s for later…. Quite a career and an excellent presentation, GP. Thank You. It is certainly my pleasure, Michael. I thank you for reading it. A long and distinguished career indeed. Good to know he was liked by the men under his command too. To this day, the 11th Association honors him as Number 1 hands down! It’s unanimous. An excellent leader and well-respected man! Thank you very much.